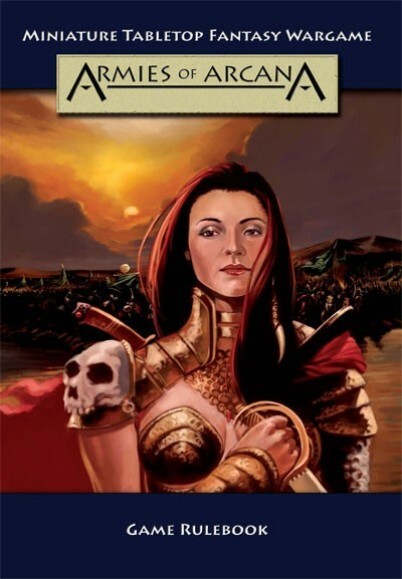 Armies of Arcana, fifth edition is a major revamp of the fourth and is in full colour. It contains 132 pages including templates and reference charts. Though this is a new edition it has not reworked the original rules only reorganised the layout for better reading. Most sections have been rewritten with the purpose of clarity. The fourth edition was published in 2002 and as such was not a true fourth version of the rules more of a combining of the three separate editions. The fifth edition brings the publication up to today’s high standards. So what’s different or new, what have we done? Well the main thing we have done is to combined the last few years of work on the forum with the existing edition and to expand the scope of the concept which is Arcana. The fifth edition will not come alone it now comes complete with a new Armies of Acrana website. First it’s now all colour with a new foreword and introduction in which we expanded the background of Arcana to give it some extra meaning. Then the book is divided into sections, the first is the basics principles with a new learn to play section for those who are new to wargaming. The second section contains all the turn sequences reworked to follow the actual turn sequence. Again some sections have been updated to follow what has been developed for the forum, especially the flying section. The next section is ‘To Battle’ - this has had a major reworking. We have added terrain generators, a new scenario - Attrition, tournament rules. In the army building section we have revamped the vehicle, war machine and creature creation parts all now carry example of how to make them and are much easier to read and use. The spells have had little done to them other than some realigning by Thane. The last section contains the army lists and templates. There are now 23 official army lists plus the monsters list. We have not included them all in the book, purely because of size but they will all be available to download from the website. We now have new reference and summary sheets and templates in the back, with Terrain Warehouse UK bringing out 3D template and markers soon. We are the US source for the book. Please note the store does not have a usable flat rate shipping option for this item. Refunds will be sent to correct this on the necessary orders.